The end products of egg tray making machine are egg trays. The raw materials of making egg trays are original wood pulp, craft paper, old newspaper, old books and other kinds of recycled papers. You can get raw material easily. 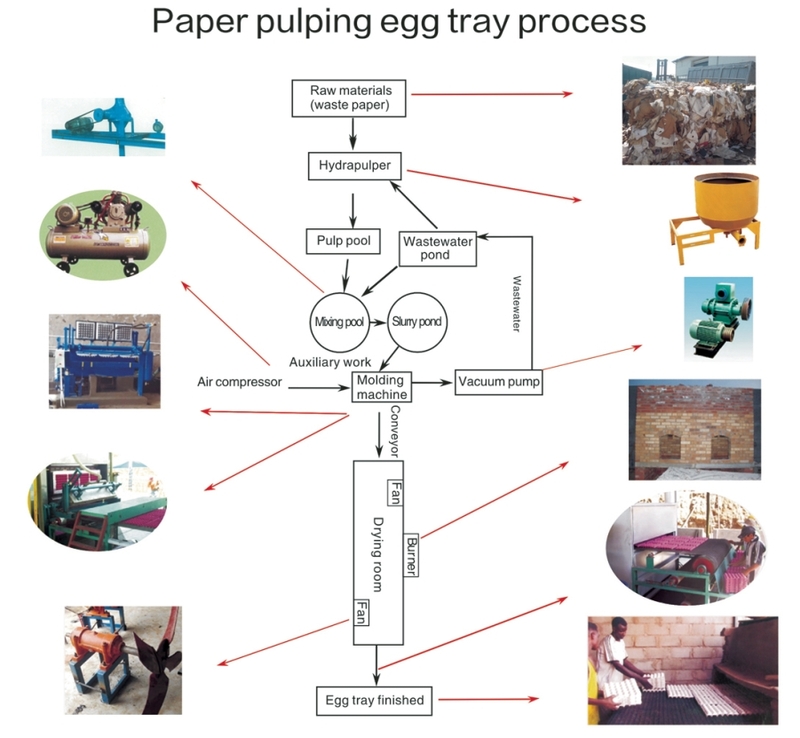 If you run an chicken farm, you can buy this paper pulp making machine to make egg trays for packing your eggs. 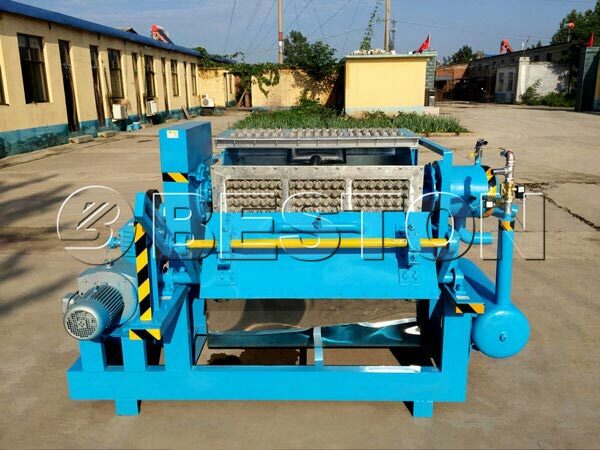 Or, if you have a amount of recycled paper, you also can purchase this machine to make waste paper turn into egg trays. 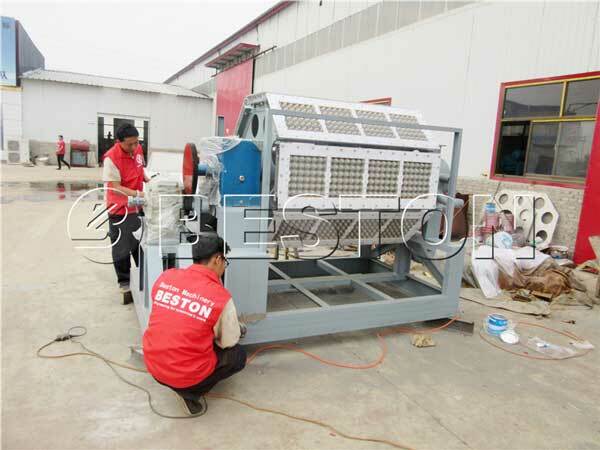 Many customers would like to buy egg tray machine from we Beston Machinery. Here, you can see our customers picture. Our customers come from all over the world, such as Algeria, Egypt, Russia, Ukraine, Australia, Argentina, Brazil, Saudi Arabia, Nigeria, India, Syria etc. For customers, we have our service principle: Sincerity, Customer First, and High Customer Satisfaction. Do you want to be our reliable cooperator? Contact us now! According to productivity and automatic degree, there are three types of the machine: small, semi automatic and automatic machine. Small machine is fit for small scale factory or home. It can make 1000pcs and 1500pcs egg trays per hour. Because of small productivity, you can choose to dry the wet egg trays in the sun. With natural drying method, you can save a lot of money. If you need, we can also supply you brick egg tray drying line and mental egg tray drying line with several layers. The mould quantity of the semi automatic egg tray machine china is 12, 16, 32. It can make 2000pcs, 2500pcs, 3000-4000pcs egg trays per hour. In order to match up with productivity, you would better to choose brick and metal drying line for this machine. The advantages of the machine are: high quality, high efficiency, high productivity, etc. 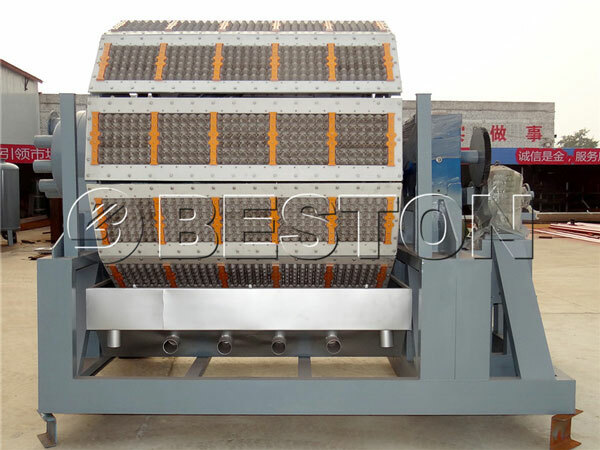 BTF-5-8 and BTF-4-12 are the models for fully automatic paper egg tray machine. The mould quantity of them are 40units and 48units. 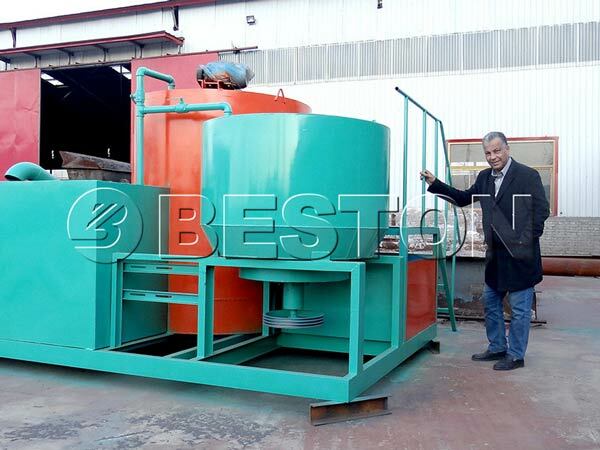 For this machine, Beston Machinery, one of professional egg tray making machine suppliers, recommend metal drying line for you. The metal drying line has several layers and adopts belt conveyor for drying. Therefore, it can complete drying process quickly and automatically. It can save a lot of time and workers cost. Pulping system: making slurry is our first step for produce egg trays. In this process, we should use hydrapulper to smash raw material (waster paper) to get slurry. Meanwhile, we should adjust the slurry concentration in the pulp pool. Molding system of egg tray production line: with the help of air compressor and molding machine, the mixed slurry can be made to wet egg trays. Then, the egg trays will be conveyed for drying through conveyor. Drying and packing system: you can choose traditional brick dying line or metal drying line. Drying can squeeze excess water in wet egg trays out. After that, we can use hot press machine and packaging machine to pack egg trays. 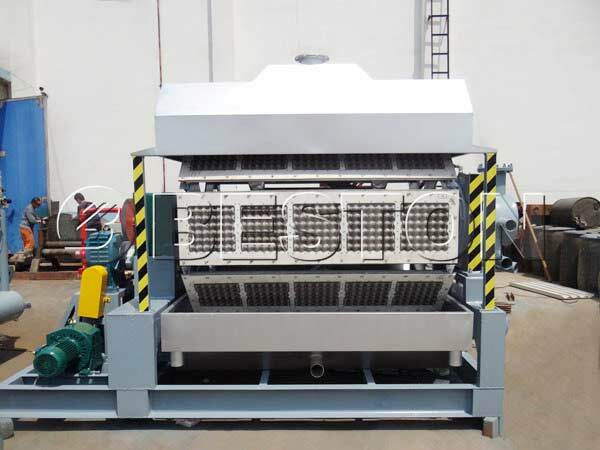 Hot press machine can reduce the volume of a large batch of egg trays. Packed egg trays can be transported conveniently. How to find a good reputable and reliable paper egg tray making machine manufacturer? There are many egg tray machine manufacturers on the internet. You should compare them from quality, price, advantages and so on. Then, choose the most appropriate one to cooperate. 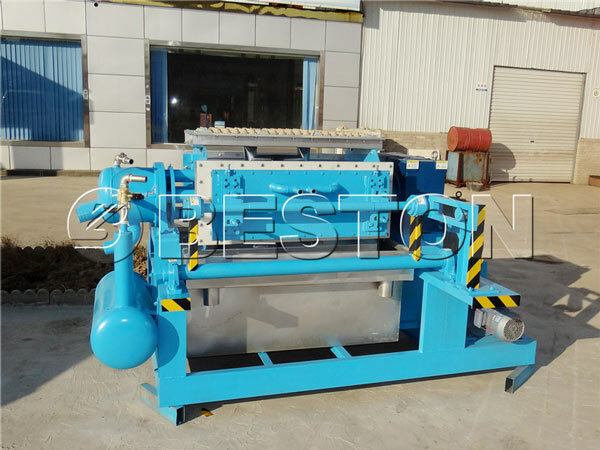 The unique process equipments: the egg tray machinery and egg carton machine of Beston Machinery can make 2.8m×1.2m( the biggest) pulp molded products. One set of BTF-5-12 tray machine can make 6000pcs egg trays per hour. If you work 10 hours a day, one BTF-5-12 can make 6000pcs egg trays. How fast the BTF-5-12 is! The wide application material: the original wood pulp, straw pulp, reed pulp, sugar cane pulp, craft paper, old newspapers, pulp, cotton pulp can be made into your satisfied egg trays. Design Concept: Supplying you a set of most appropriate egg tray manufacturing machine and helping you to save the packing cost and the cost of whole logistics process. To be the best one of egg tray machine suppliers. Quick Customers Response: if you have any questions, we will answer you as early as possible. When you have a egg tray manufacturing business plan, you may have a capital budget for the whole plan. I think the cost of egg tray machine is the first thing that you should know. The manual egg tray machine price is the cheapest. If you don’t have too much money, you can choose to buy BTF-1-3 and BTF-1-4. Also, you should know the productivity of BTF-1-3 and BTF-1-4. If they can meet your requirement, buy them now. 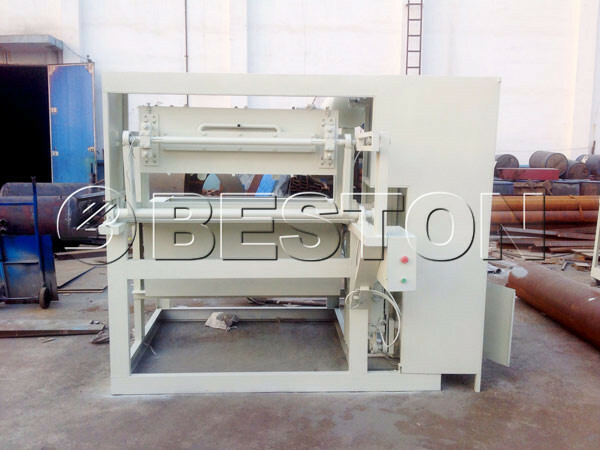 The semi automatic and automatic machine have higher paper egg tray making machine price. Accordingly, they have high productivity and high automatic degree. To concluded, you get what you pay for. We Beston machinery will give you competitive price. If you have special configuration demand for eggs tray machine, let us know. We will give you the price on the terms of your need. According to egg tray making project report, paper egg tray is the most popular packing product on the market. Compared with plastic packing product, paper egg tray is more environmental friendly. With paper egg tray, you don’t need to worry about degradation. The used paper egg tray can be recycled to make new one. In order to conform to the theme of environmental friendly, many users like to buy eggs with paper packing. Therefore, paper tray making machine has a great market prospect. So, if you want to start a new business, paper tray machine is worthy of your investing. 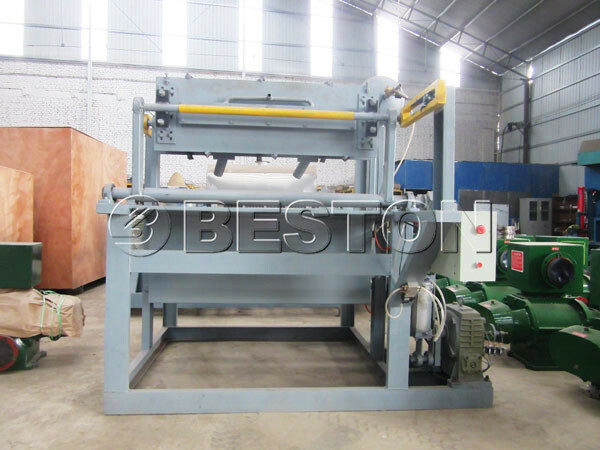 Beston Machinery have good quality paper making machine and egg tray machine for sale. Meanwhile, we will provide you 24h per-day and after-sale service. You can rest assured to buy egg tray machine from us. Contact us now!